Famously, Apple started out of a garage with little up-front cash. But your typical startup requires more than just a some empty space and a brilliant idea. To create a successful company, you need some money to pay for office space, employees and everyday bills from utilities to legal fees. 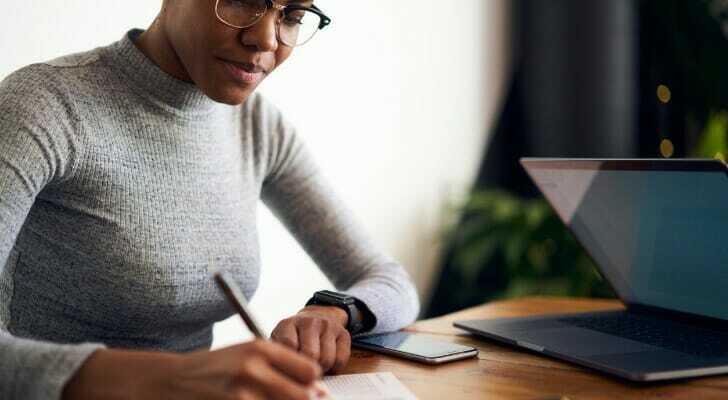 This can dampen entrepreneurs’ ability to bring their business ideas to life especially if they don’t have much capital in their savings account. Imagine trying to start a new company in San Francisco with its exorbitant cost of living. 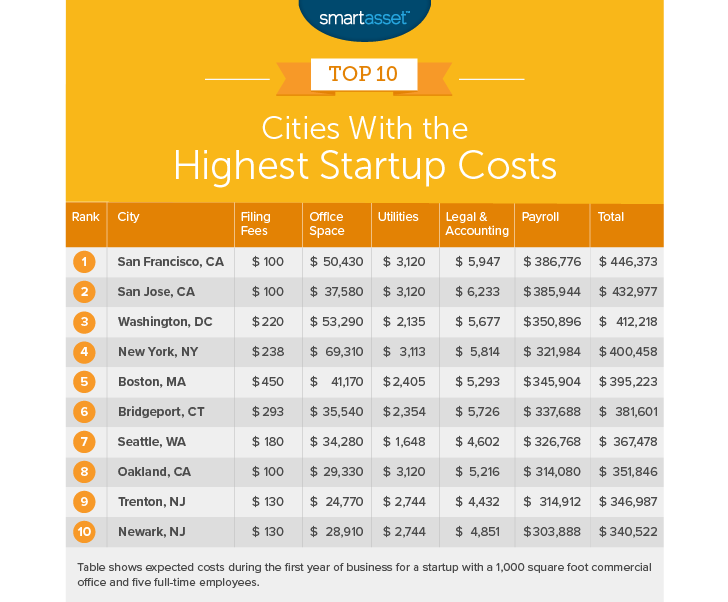 Below we look at a slew of factors to rank the cities with the lowest and highest startup costs in the country. To rank the cities with the lowest startup costs we looked at data on a variety of metrics that affect businesses. We looked at the cost of filing fees, office space rentals, utilities, lawyers, accountants and payroll for five employees. For a more detailed breakdown of our methodology and sources see our data and methodology section below. Startup capitals are expensive – When you think of startups, you think of the Bay Area or maybe New York. But according to our data, those cities, along with Washington, D.C., are the most expensive places to start a new business. Of course, depending on your industry, like finance in New York or tech in San Francisco, being in a particular place is worth the additional costs. In such a case, you may have no choice but to set up shop in in the most expensive areas if you want your startup to succeed. Tennessee is plenty affordable – In total, the Volunteer State has three representatives in the top 10. Chattanooga takes the top spot while Knoxville and Memphis take eighth and ninth respectively. Chattanooga, Tennessee is the most affordable place to start a company, according to our data. Office space here is affordable and hiring workers for your business won’t bankrupt you, at least right away. We estimate payroll for five employees will cost just over $214,300 per year. Combine payroll with renting an office and paying your lawyer and accountant and we estimate the annual cost of running a new business in Chattanooga to be about $236,600 per year. Kansas’ largest city comes in third. Filing fees here are some of the lowest in the top 10 at only $140. The cost of renting an office is also very reasonable. According to our research 1,000 square feet of office space should cost about $14,720 per year. Even the cost of lawyers and accountants is lower than in the two cities ranked above. Wichita falls to third because of payroll costs. Five full-time employees will cost over $219,300 on average, the Bureau of Labor Statistics estimates. 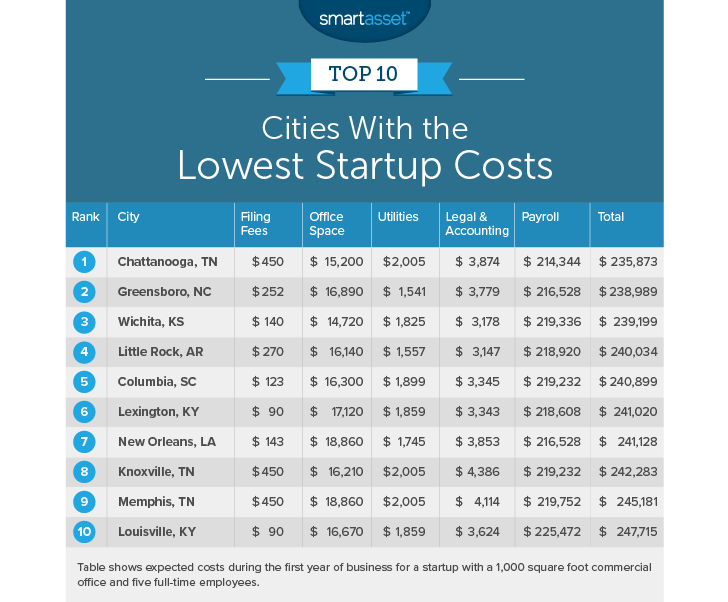 According to our data, Arkansas’ capital has some of the lowest startup costs in the country. In all but one metric, filing fees, Little Rock is more affordable than average. And while filing fees in Little Rock may be higher than average, it’s unlikely your business will succeed or fail based on the cost of filing fees. In particular, labor costs here are affordable. The annual cost of five full-time employees is about 15% less than the study average. Taking the eighth spot is Knoxville, Tennessee. Legal and accounting costs here are higher than the national average, hurting the city’s score. Filing fees and utility costs are also fairly high relative to those of other locations in our top 10. Where Knoxville jumps ahead of other cities is in the cost of office space. According to our data 1,000 square feet of office space should cost just over $16,210 per year. After factoring everything together, we estimate the cost of running a startup for one year to be about $242,300. Businesses are risky – As the above analysis showed, investing in and building your own business is risky. The rewards can be great, of course, but if you are not 100% sure in starting your own business, it might make more sense to find more conservative investing options. But if you invest early, even a conservative investing strategy could make you some serious money. For example, let’s say instead of using $200,000 to create a startup you invest it. If you contribute $5,000 to that investment every year and get 5% returns on it for 30 years, you would have turned $200,000 into roughly $1.2 million. Trust an expert – Trying to figure out what do to with your money is a big decision. Whether you are committed to owning your own business or becoming a homeowner, it never hurts to get a second opinion. By getting advice from a financial advisor, you can limit the chances you are making any avoidable mistakes. In order to find a local financial advisor, you can trust, try out Smartasset’s financial advisor matching tool. It will match you with up to three local financial advisors.